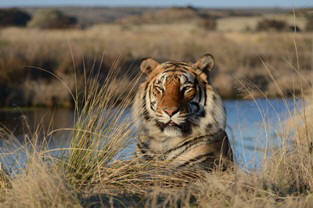 The failure of the Asian tiger countries to save the wild tiger, caused me three years ago to alter my strategy. I began to look for suitable land controlled by enlightened governments where I could set up more tiger sanctuaries. I realized that it was private individuals with the means and the vision that would save the wild tiger. However I would still need the permission of the government concerned. I was elated to find in the Eastern Cape of South Africa some excellent tiger habitat, beautiful rivers and a struggling tourist industry. I became more excited when I noticed that the slogan of the Dept of Economic Development Environment and Tourism was "Leadership, Integrity, Flexibility and Teamwork". The vision of the Department was "economic growth and sound environmental management underpinned by sustainable development". I made my application to the Department Officials for a free-ranging, self-sustaining tiger permit. I received an email which stated that tigers had large territories and I would need huge amounts of land before they would issue me a permit. Clearly I would need to be a trillionare to accommodate their requirements. I replied that viable populations of wild tigers could be maintained on high rainfall, fenced areas with a dense prey base. A relatively small area was 3 000 hectares. Our ability to immobilize tigers and move them between sanctuaries, means we can physically manage the breeding. My document went on to state that I would finance the project through tourism, as tourists were having little success in finding and photographing wild tigers in Asia. The Department's reply was that they did not believe in "exploiting an endangered species for monetary gain". This explanation still dazzles me. How do you save one of the 10 most endangered animals in the world, an apex predator, without an income? I changed my tactics and applied to the Job Creation Fund which President Zuma had just created. I reckoned that I could create 65 jobs on the back of the wild tiger. The Department's response was incredible. The ANC's policy and the President's policy is not the same as our policy. We, the Dept of Economic Development, Tourism and Wildlife, are not concerned with jobs. Our job is to protect the biodiversity of the Eastern Cape. The written response from the Department arrived on the same day that people were striking for higher wages in Grahamstown. I checked the letter carefully and it said Department of Economic Development, Environment and Tourism, surely they should be concerned about job creation. It is well known that tourism is the biggest job creator in South Africa. At Londolozi Game Reserve, 64 guests create 209 jobs. This is nearly a ratio of 4:1. I wrote to President Zuma telling him that the Department was not concerned with job creation and was blocking a R50 million investment with a potential to create 65 jobs. In the same letter I asked the President to become personally involved in the Rhino poaching problem and to legalise the trade in rhino horn. The reply I received was an irrelevant, "the president thanks me for my concern". I then gave a presentation to the Mayor of the Nhlambie Municipality in where the proposed tiger sanctuary would be and the jobs would be created. The Mayor promised to take the project the the MEC for Tourism of the Eastern Cape. I have never heard another word. So much for leadership and integrity. More meetings in an attempt to convince the Department to issue a free ranging permit for tigers which would boost a depressed tourist market in the area. The Department's responded by saying they would give me a captive permit. What tourist would come to watch a tiger pacing up and down in a cage, I wondered? So much for flexibility. In desperation, I offered to create a habituated leopard population in the area which would compliment the tiger project. The Department's response was, I could only introduce the small Cape leopard which is not readily available. However, farmers showed me pictures of leopards which they had killed when it attacked their stock. The leopards were big, easily as big as leopards at Londolozi. Common sense would tell you if the prey in the area is impala, bushbuck, nyala, kudu and warthog, to capture it, you need to be big leopard. So it was not just an exotic predator the Department had a problem with, it seemed to me they were more interested in problems than solutions. So much for economic growth and sustainable development. Through my journey across 27 properties and 19 lodges, the answers from the private enterprise, were always the same. "We are struggling with low occupancies, we are retrenching staff". It is no secret that the Eastern Cape Lodges cannot afford the armies needed to protect their rhino (see last newsletter) The syndicates know the Eastern Cape is a soft understaffed target. There will be rich pickings for the poaching syndicates in the Eastern Cape. The only way the Eastern Cape can protect their rhinos, is to hire armies the way we do. The only way you can hire an army is if you're running high occupancies. How do you run high occupancies? You show guests the Big Five, including habituated leopards on a regular basis. The Eastern Cape Lodge brochures may state that they have the big 5, but effectively to see a leopard at an Eastern Cape Lodge is rare. To stay at a luxury lodge is not unique. To sit in the dark and watch a female leopard try and hoist an impala into a tree, while four hyena leap up grabbing legs, horns, anything they can. This is awesome and totally unique. Effectively what I was offering the Eastern Cape, was two high profile tourist attractions in the leopard and the tiger. Had the Department had the vision, they could have helped the private enterprise boost their occupancies. They could have helped the private enterprise make profit and assisted them to compete in a highly competitive market. In short they could have created jobs and produced an environment to help them protect their rhinos. In my journey, I saw beautiful land, magnificent rivers and met wonderful people. Everyone asked me the same question. Is it possible to create habituated leopards in the Eastern Cape? The answer is that it is entirely possible. If the Department had vision, they could get the free ranging tigresses to habituate the leopards for them through cub relocations. This has been done at Tiger Canyons. To the people who have invested heavily in land, game and lodges in the Eastern Cape, I say politicians and civil servants are put there by the people. You need to change the narrow minded civil servants who have no leadership, integrity, flexibility or teamwork. With no options left except bribery, which is not an option, I will be forced to take the R50 million investment into a province that practices leadership, integrity, flexibility and teamwork. Hi John, good to hear from you but sorry to hear of the sorry government support. Have you tried other countries, especially Botswana, which seems to be the best run country in Southern Africa. Great to get your latest news, thank you. We cannot believe that the Eastern Cape government and Parks Board are so narrow minded when it comes to saving the worlds resources, especially seeing as we are the culprits of these animals being in the position they are in. We would like to know why they are in the positions titled Nature Conservation, if they do not know the meaning of the words are. It seems to us that they are more interested in looking after themselves and their own pockets than creating jobs and encouraging tourism to improve their economic situation. We are right behind you with the fight for these fantastic animals and take our hat off to you for your perseverance, please don’t give up. So sorry about the difficulties you having. The Free State is in a bad way. You should see the streets in Harrismith, they just potholes. We had a man come and speak to us who was a white spokesman for the government. He said very quietly we must not worry about the potholes the money is just going somewhere else. ( this we know only too well) It is said our Mayor said he’s not fixing the road to sort out the white people. Little Switzerland has had to close down along with 6 other tourist businesses because the Sterkfontein road is now not useable. We feel for you and hope things will come right soon. Sorry to hear about your getting bogged down in the quagmire of big, centralized, bureaucratic government. Being an American, I can easily sympathize, as over here across the Atlantic over the past century our government has increasingly expanded its own power while simultaneously losing faith in the prowess, intellect, and integrity of private individuals with the courage, integrity, drive, means, and ability to implement great projects that will be beneficial to society. Gods blessings in your search for a province that will accept your investment and allow you to carry forward with your wonderful work! Does this mean the Tigers are NOT in the Eastern Cape? I thought the land was purchased and ready to go. Is this email the tale of the Eastern Cape sanctuary? Do you have room for your tigers now? John, the simple reason for the bizzare replies you received from the various government bodies is that there is little scope for dipping the fingers in the honey pot. If there is nothing in it for them they are not interested. Keep fighting John. Have you thought about trying to get private investors from around the globe to buy shares so to speak in new wildlife sanctuaries? That might be the funding answer. You've said it all!!! I still believe that the tigers should be in KZN as its closer to their natural habitat but a lot more concern from the government would have been nice. Do a lot of tourists visit Tiger Canyon? I'm no expert but we have a lot of game reserves on the North Coast and they are better known than the ones in the Eastern Cape. Closer proximity to major cities like Durban might be better for you guests - after all, who cares about the animals. Convenience to man. And stomping heavily on earth and destroying everything in its path - that's man. Who doesn't care about the creatures that have more right to be where they are than man. Just ranting a bit. This is the story of many of our 34 Government departments. Indecision, inexperience, incompetence, inefficiency, ineffectiveness, ineptness make what should be straight forward - ineffable! My name is Christo and I have been involved with cheetah conservation in a captive environment for the last ten years at Cheetah Outreach in the Western Cape. I just read your email and it's astonishing how little our leaders really care about anything, except their own pockets. It is very sad indeed that we have to loose such magnificence due to ignorance. My sister in law has a lodge in the Eastern Cape (Figtree Lodge), and although I have not discussed this with them, I know they have vast land near Addo. I feel obligated to speak with them or my wife to see whether they would be interested. I have read with sadness your ill-fated attempts to help the eastern cape tourism market. This is not surprising though, given that this province is not even capable of looking after its own education or health of so many people. Looking at what the western cape has and is doing with its tourism industry, I am quite sure that there would be tremendous interest and support for a project such as you have suggested. There are a number of private and state run game reserves throughout the area, and I am sure that with the correct marketing, you would interest many people. There is a positive and "lets do it" attitude in the Cape, and I hope you will be well received. Helen Zille is able to make many things possible, why not this? I live in Durban KZN and have also been listening and watching all the goings on with our wildlife poaching etc. You make mention in your letter of how it is not unique to stay at a luxury lodge and view leopard and other wild animals however this is not financially accessible for the many South Africans living in our beautiful country. The cost of staying at a lodge is priced for the overseas visitor – I and many others cannot afford to travel and stay overnight in a lodge with my family as this would be unaffordable. Perhaps if the lodges could offer preferential rates to South Africans then they could have a higher occupancy and therefore be able to afford the “armies” required and then all South Africans would be able to take advantage of our stunning country and it’s wildlife offering! I love reading your discussions and please continue with what you are doing for our wild cats! Try Namibia, there are less idiots to deal with there!!! I shudder to think what the future of our beautiful land is for all of us, not just the animals, when I read articles like yours here. Thank you so much for all you do to preserve all these magnificent animals. I can pass on your information and I do- widely. I hope this helps to increase awareness and support for your work. Good, well...bad, but as an investor and a dreamer (also of tigers roaming free in Africa) my question is: can't you do whatever you want (within certain limits, of course) in your own property, provided all security measures have been taken in place? In other words, assuming one has the amount of money required to realize a project like that, on a large nature conservancy, can authorities stop you? I'd like you to revert to me with an answer. Thanks for your efforts and best regards. Hello Mr. John... God bless U for u r efforts for natural conservation. If U spread u r tiger project Beyond ' tiger canyon' that will be more successful story of u r dream about tiger conservation. There are big national parks and wild landscape in African continent. If u expand ur Tiger project one of those National parks where Tigers have proper environment that will be big achievement for U as well as Tigers. If u think that Tigers cant share there territory with Lions, then choose such a landscape where all African wild animals found except lion. If u get area about 1000 sq.km. wild landscape that will be enough to survive more than 60 wild tigers. But u need to have enough pray base for tigers. Animals like Zebra, Wildbeast, Wildpigs, and the big Cape buffelo. In India the Tigers are known to take down the adult Male Bison and full grown Indian Rhino. So pleas think about this project. If u succeed there will New territory for Tigers outside of Asia. Here in India's protected national parks ,every 7 days ... 1 tiger is being Victim of Poachers. Same story is for other Asian country. Untill china stop its Demand for tiger parts ,Tigers are not safe in India. I have been a keen follower of your Tiger Canyons tale for the past 4 years. Whilst at University at Potchefstroom, I even wrote a letter to Salomentsi indicating that I do believe in your vision and I have written you letters in the past to encourage you. I totally agree with you that the various ‘subspecies’ of tigers are not so. My understanding is that tigers adapted to different shapes and narrower stripes to suit their habitat. The Siberian tiger’s larger body mass enables it to withstand the bitter cold 9as small animals suffer in extremes), the Bengalese, Indo-China and Chinese tigers are very similar due to habitat consisting of jungles, grasslands and rocky areas and the man-made boundaries is the only factors that classify these animals into the current so-called subspecies, and the Javan, Bali and Sumatran tigers were smaller with closely set stripes because of their jungle environment. In short, natural selection gave the form to the different tigers in different habitat. Your opinion that interbreeding tigers with other ‘subspecies’ is thus the future to ensure viable genetic stable individuals. I had an idea during my university days (before I read of your success in Philippolis) that tigers be kept in 1 ha camps. Males in the middle, surrounded by females in camps. Gates would be able to open between the males and the females as to ensure breeding and tigers would be able to get to know each other through their fences (much the same as Tiger Canyons, just smaller). Then, there would be game animals freely grazing in the camps. Elevated boardwalks would cross the camps and tourists would be able to view tigers from above (say 5 metres, according to Jim Corbett, tigers seemed to pay less attention to what is happening above them and thus he was very successful in hunting them by sitting in a tree). I do not feel that the tiger has any future left in Asia, actually, I do not feel that any wild creature that needs large spaces with sufficient core areas and no pressure from the human race have a future in unfenced areas, as this allow individuals to cross over the park boarders too easily. South Africa is the only country in the world that has fenced in parks, keeping lions, buffalo, elephants inside. The same could be done with tigers, they are not different to lions in keeping them fenced in (Tiger Canyons for example). The tiger could fill the niche of a lion in a park, where elephant rides could be introduced as in Nepal, rhino’s could co-exist as in India, Nepal with the tiger and leopards could also be there. As in the Gir forest, lions and tigers even co-existed. This would however, not be the focus of such a park. Where tigers and rhino’s benefit from the same anti-poaching units administered by South African game business, this is what the world needs. The province where there is wide-spread maladministration ( I grew up in East London), with huge potential for wildlife. Even more so than KZN, I believe, due to no malaria, tsetse-fly or poisonous ticks to talk of. Water aplenty, especially the Transkei, and the possibility of approaching farmers with such a project should be good (until I read your newest letter). Even after your injuries sustained at Tiger Canyons, I would like to implore you to not stop your work. The tiger is a symbol of many Asian countries, sadly, they lack the political will, the knowledge and the love of animals to do your work. The tiger and the crocodile has always been symbols of freedom and unspoilt nature to me: the crocodile and alligator of clean water, the tiger of untamed forest and pristine mountains. Sadly, this is no longer the case, as all animals now must make due with scraps offered by humanity for their survival. I would like to offer assistance to you should you ever need a friend in animals. Keep on believing in your vision, you have been a pioneer in wildlife, keep on. Read this babes, makes you realise (as you do anyway), just how ridiculous our, “you know what’s” are!!!!!!!!!!!!!!!!! Try the Western Cape Provincial Government. I do not know if you will find suitable habitat or opportunities there, but we have worked with the Department of Economic Development and Tourism Department (DEDAT) AND THEY ARE THE MOST DYNAMIC AND EFFICIENT WE HAVE EVER ENCOUNTERED in all the National or Provincial departments we have ever worked with. Jo-Ann.Johnston@pgwc.gov.za. She may be able to refer you to the relevant person if she cannot help. Nicely put JV, my sentiments match precisely; the guys making the decisions have blinkers on and don’t know the value of the opportunity lost to the E/Cape.